ETS (Educational Testing Service), created this publication. ETS is the nonprofit educational organization in Princeton, New Jersey, USA, that develops and administers the TOEFL® test. TOEFL® iBT Tips is designed to help English-language learners understand and prepare for the TOEFL® Internet-based test (TOEFL® iBT). As learners prepare for the test, they also build the skills required for academic success. 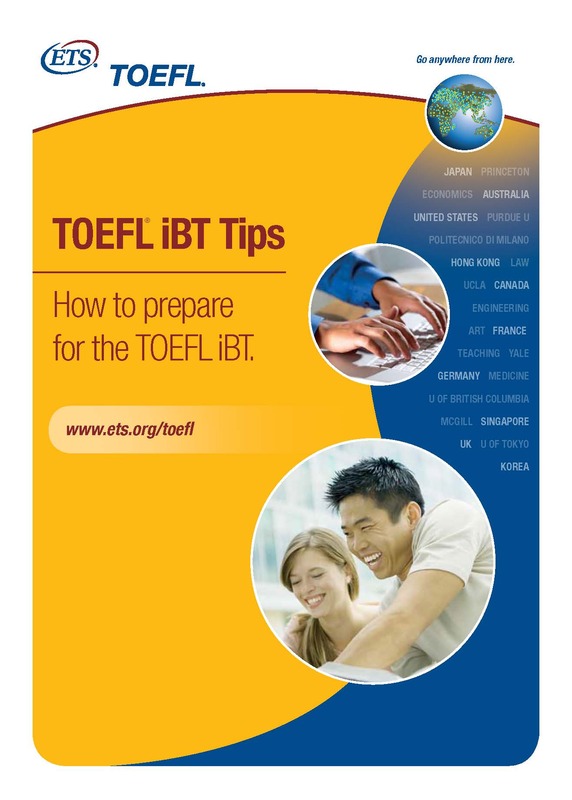 TOEFL iBT Tips also supports ESL/EFL instructors and educational advisors as they help students with test preparation. TOEFL iBT Tips does not replace the Information and Registration Bulletin for TOEFL Internet-based testing, which contains information test takers need to register for the test. To download the Bulletin, visit the TOEFL website at www.ets.org/toefl or write to TOEFL Services, PO Box 6151, Princeton, NJ, 08541, USA, to receive a copy. The TOEFL test gives students the opportunity to prove they can communicate ideas effectively by simulating university classroom and student life communication. The language used in the test reflects real-life English-language usage in university lectures, classes, and laboratories. It is the same language professors use when they discuss coursework or concepts with students. It is the language students use in study groups and everyday university situations, such as buying books at the bookstore. The reading passages are from real textbooks and course materials. The TOEFL test measures how well students use English, not just their knowledge of the language. Because it is a valid and reliable test with unbiased, objective scoring, the TOEFL test confirms that a student has the English language skills necessary to succeed in an academic setting. That’s why it has become the most popular and accessible Englishlanguage test in the world. It has been administered more than 20 million times since 1964, and is available in more than 180 countries. It is also the most accepted test in the world. More than 6,000 colleges, universities, and agencies in 110 countries accept TOEFL scores. That means that students have the flexibility to use their TOEFL test scores worldwide. First introduced in 2005, TOEFL iBT is being gradually introduced throughout the world. The paper-based test continues to be offered to supplement the TOEFL iBT test center network and in countries where the TOEFL iBT is not yet available. To view a list of TOEFL test center locations, visit the TOEFL website at www.ets.org/toefl.